This summer, the planet experienced catastrophic wildfires all over the world. 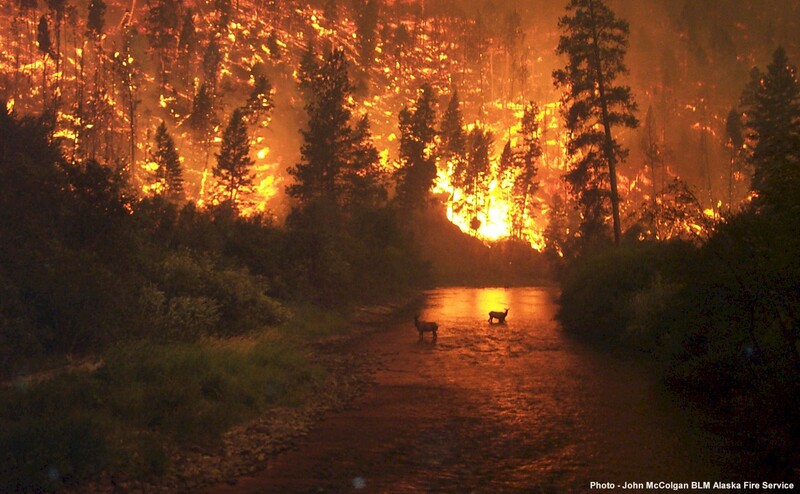 Devastating, record setting fires struck Colorado, New Mexico and many other states and nations. In 2007, the International Panel on Climate Change (IPCC) predicted that increasing fire risks would be one of the first major impacts of global climate change. All around us, we are beginning to see tangible, physical evidence that global climate change is happening. Yet, US reporters continue to confuse the debate and stall solutions. On October 18th, 2012, David Brooks published “A Sad Green Story” on the New York Times’ opinion page. In his article he claimed that 2003 was the high mark for attention to the issue of global warming. Since then, he stated, the topic has become marred by partisanship, which began with the release of Al Gore’s ‘Inconvenient Truth.’ Unfortunately, this overplayed claim about scapegoat Al Gore does not appear to have any evidence behind it. Nor do several claims about renewable technology. What drives US attention to global climate change? In 2011, Texas A&M associate professor Xinsheng Liu performed an analysis of media and congressional attention to global climate change. He and his co-authors found that high profile international events, like the release of a report from IPCC or the United Nations Framework Convention on Climate Change (UNFCCC), were the greatest drivers of attention. Additionally, presidential politics played a role. Earlier this year, Drexel University professor Robert J. Brulle found that the years between 2007-2009 saw the most significant changes in concern about global climate change. 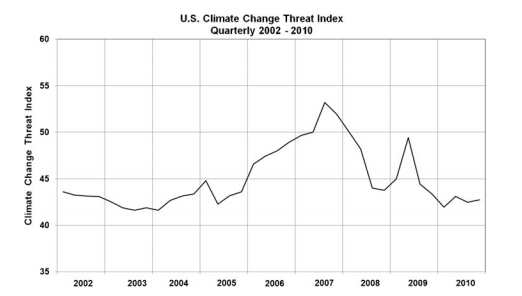 During these years, an IPCC report was released in 2007. The Presidential election took place in 2008 and, after winning, President Barack Obama supported cap-and-trade legislation meant to regulate greenhouse gas emissions with free market policies. In 2009, the infamous, ‘Climategate’ scandal attacked the IPCC’s credibility (which has since been restored by eight investigative committees across the world). All of this is important because there is wide evidence that the more often a topic is covered in the media, the more concern is expressed by the public (the media doesn’t tell us what to think, but with story satuaration outlets can tell us what to think about). Thus, given all this evidence, David Brooks’ claim that 2003 was ‘the golden spring’ for green issues just does not add up. Same goes for his lament about Al Gore. Even so, global climate change is an ongoing problem, not a fad. It has not seen the end of its days in the spotlight because it is not going to go away, even if some people want to cover their eyes and ears when the problem is mentioned. Floods, fires, and other natural disasters have already dominated the news cycle over the last few years according to Yahoo’s yearly review. Nearly every scientific organization on Earth agrees that global climate change is happening. Slowly, the dots will be connected in the media and we will be able to openly discuss disaster prevention, response, and recovery without fighting over the predictions and science related to global heat increase. The facts are that the Earth has heated exactly 0.7 degrees Celsius in the last century, according to NASA. About one-third of that heating has occurred since 1980. This kind of accelerated heating has never been observed in nature. According to NASA’s natural timeline of global heating, a century has historically brought between .08-.14 degrees Celsius of heating. That means the planet is heating nearly 10 times faster than it has in the past 800,000 years. This is a strange observation considering that the United States is the top producer of solar products, natural gas, and geothermal energy. The real disappointments may actually be coal where China out produces us, nuclear where we do not even make the top ten, and oil where we place third in an international market. David Brooks’ has received wide criticism for his article, most notably from Ezra Klein at The Washington Post. Brooks’ claims that global climate change left its spotlight in 2003 and its bi-partisan approval in the movie theatre with Al Gore are not supported by evidence. Nor are his feelings about green, local, renewable energy. Since 2007-2009 there has not been another presidential election or IPCC release (there were annual UNFCCC events). When these did occur, each gained significant attention and likely will in the future. The next IPCC release is set for 2014 and if Barack Obama wins the presidency this year he has promised a renewed focus on green jobs, energy efficiency, and transportation. The truly sad story is not about global climate change’s waning popularity – as if! Were this true 74% of Americans would not be convinced the problem ‘is affecting weather in the United States.’ In reality, the sad truth here is that a respected, intelligent reporter like David Brooks did not bother to do his fact-checking before presenting his opinion about issues that affect the entire global community.